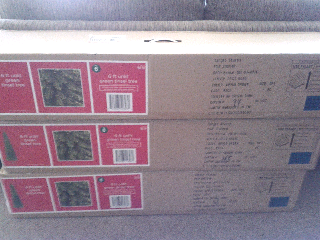 Yep that's 3 boxes, each packed with its own tinsle tree. Why three you ask? Because at $6 a pop I just couldn't resist. Especially because they were originally $60 each! I also got a ton of othe stuff from Target. All of which was 90% off. Excuse me while I go do my "I just scored" dance.